The Republic of Moldova is the least visited country in Europe as well as the poorest country in Europe. However, Moldova has been producing wine for about 5,000 years and currently exports about 67 million bottles annually. I recently wrote an article encouraging people to be wine activists, to buy and drink wines from certain countries, to help their economies thrive. "Financial support of a country’s wines contributes to the well-being of regions, countries, and producers." Considering Moldova's economic situation, then supporting their wine industry is more than warranted, especially considering they are producing some delicious and interesting wines. Recently, I was contacted by Andrei Birsan, the owner of Vins Distributors, a wholesaler of Moldovan wines, and invited as a media guest to taste some of his portfolio, as well as to experience Moldovan cuisine at the Moldova Restaurant in Newton. I've previously tasted only a handful of Moldovan wines but my experience had been very positive. And I'd never previously enjoyed Moldovan cuisine so I was eager for this meeting. Andrei grew up in Moldova, leaving the country when he was 21, and came to the U.S. He underwent some training in the law and never thought about a career in the wine industry. However, in 2014, on a trip to Moldova, he tasted an ice wine, falling in love with it. When he returned to the U.S., he wanted to import it but knew he couldn't make a career out of a single wine. So, he decided to import a number of Moldovan wines, to showcase his home country in Massachusetts, and received his first shipment of wine in July 2015. His portfolio currently has about 40 Moldovan wines, which should increase soon by about 10 more. During the course of our dinner, I tasted eight different wines and found Andrei to be a charming, knowledgeable and interesting person. It was clear that he was passionate about the wines of Moldova and it was infectious. These were wines that would please most any wine lover, and several of them were excellent values as well. They were also excellent food wines, though some could easily be enjoyed on their own too. As I mentioned earlier, wine originated in the region of what is now Moldova about 5,000 years ago. The area became the Principality of Moldavia in the late 14th century, remaining dominant until 1812 when Russia seized control. Russia later subsidized French colonists to come to the region, and they uprooted most of the indigenous grapes, replanting them with French varieties. Who knows how many indigenous grapes might have been lost due to this uprooting. Once the Soviet Union dissolved, Moldova, which is located between Ukraine and Romania, declared its independence, similar to what occurred in Georgia. Currently, Moldova has about 150,000 hectares of vineyards, growing over 30 different grapes, about 10% being indigenous varieties, such as Fetească albă, Fetească regală, Fetească neagră, and Rară Neagră. About 70% of their production are white wines and they export about 67 Million bottles of wine annually. One of their biggest trends currently is creating blends with both indigenous and international grapes. Though only about 5% of their vineyards are organic, Moldovan wine law prohibits the addition of any chemicals into wine. There are four different wine regions in Moldova, including Balti (northern zone), Codru (central zone), Purcari (south-eastern zone) and Cahul (southern zone). According to a new law enacted in 2016, producers must place the regional designation on the label. Some of these regions also have micro-regions. For example, in Cahul there are micro-regions including Taraclia, Ciumai, Comrat, Ceadir-Lunga, Baurci, Cazaiac, Tomai, and Cimislia. Let's highlight a few indigenous grapes from Moldova. Fetească Albă (which translates as "white maiden") is a white grape, the most widely planted indigenous grape in Moldova, occupying about 4,334 hectares. When you consider the country has about 150,000 hectares of vineyards, plantings of the Albă constitute only a tiny percentage, less than 3%. Albă is also found in Romania and Hungary. In Moldova, Albă is commonly used for producing sparkling wine, as well as still wine, which posses medium acidity, as well as citrus and floral flavors. Fetească Regală (which translates as "royal maiden") is also a white grape and allegedly acquired its name when the grape was dedicated at a birthday celebration for Queen Elena of Romania and thus acquired its "royal" status. The grape is more commonly found in Romania, with some also found in Hungary and Austria. However, in Moldova, the grape is sometimes blended with Fetească Albă and a distinction between the two isn't always made clear. Regală can make aromatic wines with good acidity. Fetească Neagră (which translates as "black maiden") is a red grape that early vanished during the Soviet era but which has been making a comeback since Moldova gained its independence. The grape can be found in part of Romania too. It is commonly used to make dry, sweet and semi-sweet wines, which typically have a deep red color and a black currant flavor. Rară Neagră (which translates as "black grandmother"), also known in Romania as Băbească Neagră, is a red grape which typically makes wines with high acidity, a lighter red color, and red fruit flavors, especially sour cherry. There are only about 170 hectares of this grape grown in Moldova, and a little is grown in other places, including Romania, Ukraine and even in the Finger Lakes region of New York (where it is known as Sereksia). All of the Moldovan wines I tasted from the Vins Distributors portfolio are available at the Moldova Restaurant in Newton, as well as a number of wine stores in the Boston area and elsewhere. At the Moldova Restaurant, all but one of the wines they carry are from Moldova, the outlier being a French Champagne. I'm always supportive of restaurants that choose to stock primarily wines from the country of their cuisine. First, those wines go well with the traditional cuisine of their country. Second, it helps customers expand their palates and try something different. Third, it gives a market to wines that might otherwise have difficulty getting on wine lists elsewhere. Their wine list has wines available by the glass, carafe and bottle, though not all selections are available by the glass or carafe. There are 4 White wines available by the glass/carafe with an additional white wine available only by the bottle. There is one Rosé wine available by the glass, carafe and bottle. There are 6 Red wines available by the glass/carafe with 2 additional Red wines available only by the bottle. There are 2 Sparkling wines available by the glass/carafe with 2 additional Sparkling wines available by the bottle. Prices per glass range from $6-$13 with prices by the bottle ranging from $23-$90, with most priced $50 and under. You can also order a Wine Sampler of three different wines. I began my tasting with some Moldovan Sparkling Wine. The Cricova Winery, founded in 1952, is located in the town of the same name and their wine cellars are the second largest in Moldova. About 62% of the wines they produce are Sparkling. The Cricova Crisecco Vin Spumant Alb Brut, a blend of 90% Fetească Albă and 10% Muscat, is produced by the Charmat method (like most Italian Prosecco). At 12.5% ABV, this bubbly is aromatic, with a distinctive Muscat nose enhanced by some citrus notes. On the palate, it is dry, crisp and tasty, with flavors of apple, pear and subtle citrus. A very pleasant and easy-drinking Sparkling Wine, priced under $15, it is also an excellent value. I definitely want to explore more of Cricova's Sparkling Wines. Chateau Vartely is a newer winery and "Vartley" means "city-fortress." Their 2015 D'Or Fetească Regală is made from 100% Fetească Regală, from vineyards in the Orhei region. The wine, with a 14% ABV, is vinified in stainless steel and then spends up to six months aging in oak barrels. It possesses an intriguing aroma, a combination of fruit and savory notes, both which come out on the palate too. It is a full-bodied white wine, with an intriguing sour apple element, accompanied by notes of lemon, herbs and a hint of fresh mowed grass. A more unique and delicious white wine. The Purcari Winery, founded in 1827, has a storied history. 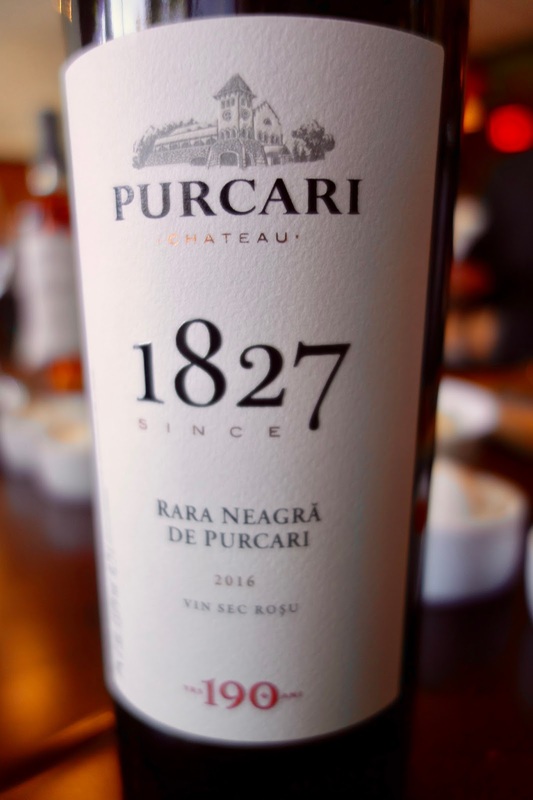 It was in 1827 that the Emperor of Russia, Nicholas I, issued a special decree which granted Purcari the status of the first specialized winery in Bessarabia. By 1878, the winery was receiving international attention and had been served to kings and queens across Europe. At the turn of the century, the winery replanted about 250 hectares of their vineyards, and installed state-of-the-art technology at the winery. The 2014 Rosé de Purcari is a blend of Cabernet Sauvignon, Merlot and 10% Rară Neagră, with a 13% ABV. The wine is dry and crisp, with subdued red fruit flavors, a bit of peach, and a hint of herbal notes. The 2016 Rară Neagră de Purcari was impressive, luring me in from my first sniff of its compelling aroma. 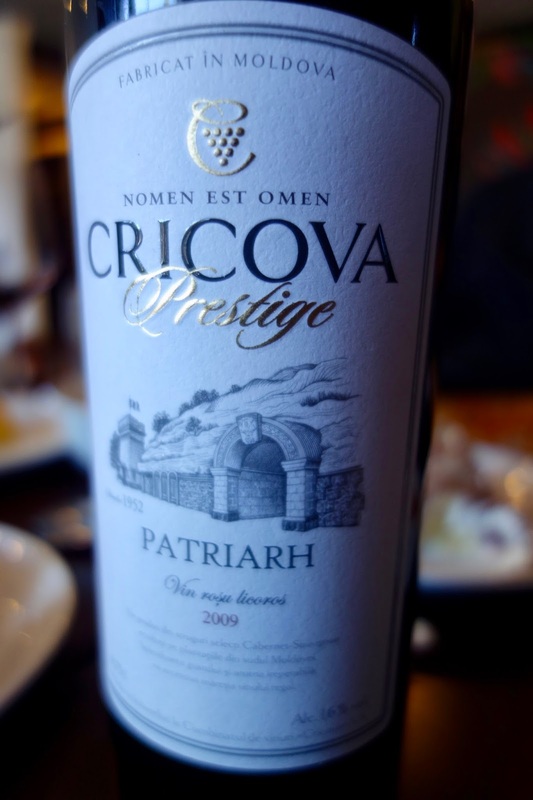 The wine is made from 100% Rară Neagră, was fermented in stainless steel, aged in French oak barriques and has a 14% ABV. The aroma is very savory, with black fruit accents and subtle spicy notes. On the palate, it is medium-bodied, with soft tannins and good acidity. It presents an intriguing melange of bold flavors, ripe black fruit, spicy notes, hints of vanilla, and an almost meaty undertone. A lengthy finish completes this well balanced and delicious wine. At around $22-$23, this is a very good value for such a tasty and interesting wine. I also got to taste the 2014 vintage, and it was not as big and bold as the 2016, though it contained a similar flavor profile, just in a more subtle way. 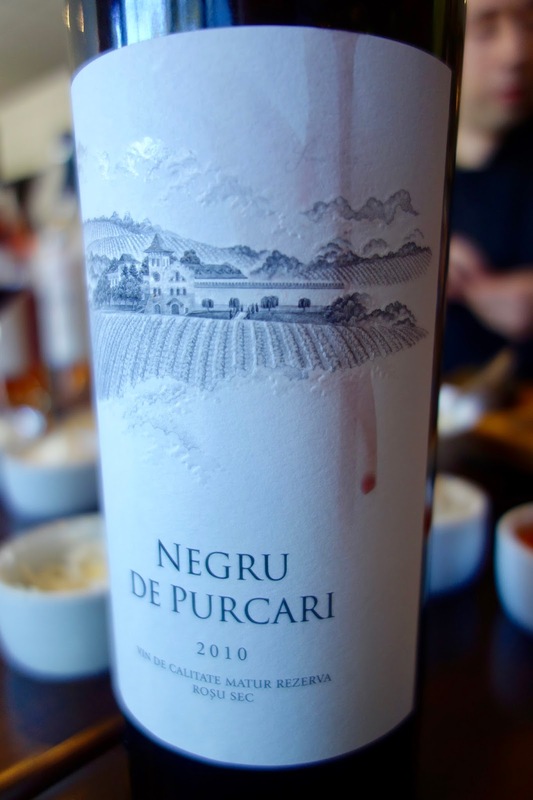 The 2010 Negru de Purcari ("black of Purcari") is the signature wine of Purcari and it is sometimes called the "Queen's Wine" as it was a favorite of Queen Elizabeth II. The wine is a blend of 70% Cabernet Sauvignon, 25% Saperavi, and 5% Rară Neagră. It has been aged for about 18 months in French oak and has a 14% ABV. 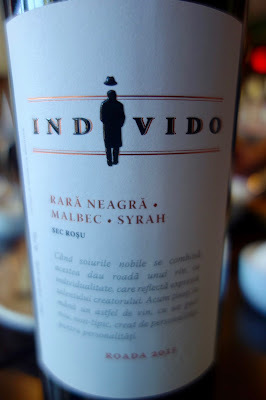 With a dark red color, it has an alluring nose of black fruit, spice, and earthiness. On the palate, the ripe plum and black cherry flavors dominate, supported by a rich spiciness, and a mild earthiness. It is full-bodied, with well-integrated tannins, a silky mouthfeel and a lingering and satisfying finish. This is a well-made blend which is sure to impress any wine lover. Highly recommended. The 2015 Chateau Vartely Individo is an interesting blend of 42% Rară Neagră, 30% Malbec, and 28% Syrah, which spent about 12 months in French oak barrels. The aroma combined red and flack fruits with a spicy undertone. On the palate, the red and black fruit flavors shone, supported by spicy accents, and hints of vanilla and chocolate. Restrained tannins, a supple mouthfeel and a lengthy, pleasing finish. Finally, we ended the tasting with the 2009 Cricova Prestige Patriarh, a vin rosu licoros, a red dessert wine that is made from Cabernet Sauvignon and has a 16% ABV. I was expecting a heavy, sweet wine but that was far from the case. Instead, it had a lighter body, with intense ripe plum and fig flavors and only a moderate sweetness, balanced by some nice acidity. It was silky and delicious, an enticing wine which made for an excellent after-dinner drink. Overall, the Moldovan wines were delicious and interesting, pairing well with the various foods we enjoyed. I strongly encourage all wine lovers to explore the wines of Moldova, especially those with indigenous grapes. The Moldova Restaurant is a great place to sample these wines, especially paired with Moldovan cuisine. Those wines though will work well with many other cuisines too, from simple pizza and burgers, from oysters to pasta, from pork to steak. And by buying & consuming Moldovan wines, you will help the overall well-being of that small country.